I use the Remote System Explorer in Eclipse for editing PHP web sites on other networks, and I occasionally run into the problem when an old page gets loaded instead of the actual, current page on the site. The problem is that the old file is being cached somewhere on the system and this cache needs to be cleared. Restarting Eclipse wonâ€™t clear the cache, and starting Eclipse the â€“clean option doesnâ€™t help either. 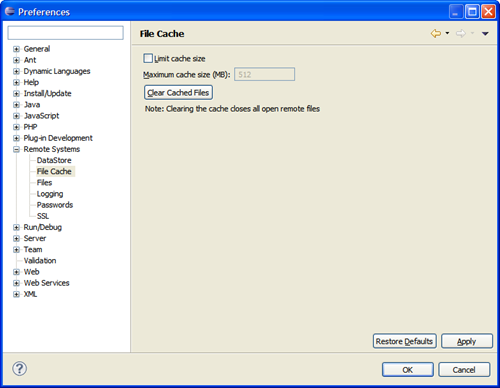 The cache can be cleared manually by going into Preferences, selecting Remote Systems, and then selecting File Cache. Pressing the Clear Cached Files button will empty the cache, allowing you to open a current file in your web site. This should be a command line option in Eclipse because Iâ€™ll have to periodically run this command when the wrong file gets loaded. An option here is to limit the cache size to a small amount so that it wonâ€™t hold needed files in the cache for long.